I loved your previous post, it was introspective and also very relevant for me… particularly when it comes to cooking. This is about just that. I love bean soup, but I don’t cook it very often. Because every time I prepare this type of soup, it lasts for EVER… for a week straight we eat beans in every way possible. Each night varying the toppings, injecting beans into other dishes, and tossing them into salads. So by the time we have finished them… we don’t want to look at beans for a long time. As such, I forget how I had last prepared them, and every time I am faced with the same problem: I need a recipe because I cannot remember how I made it in the past. Finally, after scouring through books and websites, I find out that none really hit that sweet spot that I am looking for: where Cozy meets Smokey and Spicy. So I throw everything aside and decide to just get cooking, trusting that through my experiments, I will land on the right blend of spices and flavors along the way. End result? 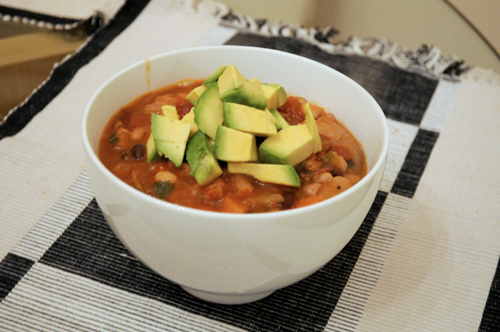 This bean soup is pretty delicious… but, strangely it tastes the same every time I make it! Despite decidedly trying to make it different every time I prepare it, it seems deep down somewhere my unconscious is making these choices for me. In this case, I am quite happy about it, although I have to say this time I nailed it and here is what I have to share with you and our friends! One new note I did add is the avocado topping, which I borrowed as an idea from the Colombian Ajiaco. It added a wonderful creaminess, without the weight you can feel from adding sour cream or cheese to a rich bowl of beans (although, the next night I went for the cheese anyway 🙂 ). Soak the beans in ample cold water and let sit overnight. 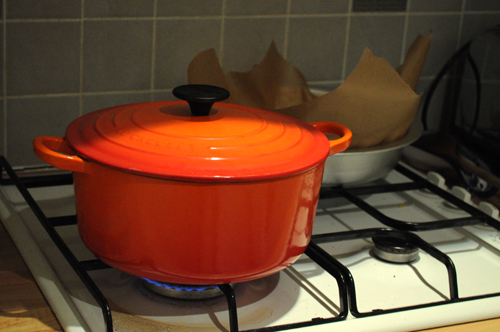 In a large dutch oven, heat 2 tbsp olive oil on medium. Fry the shallots, carrots, celery, peppers, spices stirring, until softened – about 10 minutes. 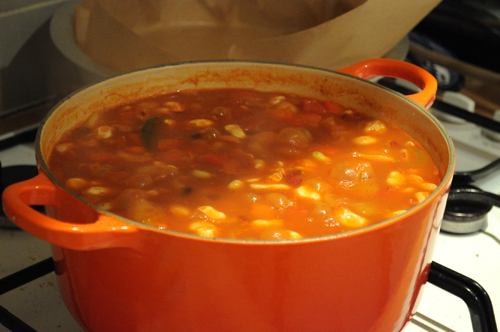 Add chopped tomato, water, beef bouillon and drained beans to the dutch oven – bring to the boil. Once boiled, turn down heat and simmer for 1 hour. Add chopped parsley, 2 tbsp olive oil and red wine vinegar and stir through, simmer for 10 more minutes. Serve in individual bowls topped with chopped avocado, enjoy!